Last weekend we dined for the second time at JoLe Restaurant (Calistoga). Both times it has been great. It’s currently one of our favorite Napa Valley restaurants and certainly ranks as one of the best up Calistoga way. Service started off sputtering but rapidly improved. Our table wasn’t ready until about 20 minutes after our reservation and then after we were seated, it took a an uncomfortable, unusual period before being greeted by our server and then for him to return to take our order. I think there may have been some confusion on who we “belonged” to. Anyway, they caught up and we were treated in a professional and friendly manner for the rest of the evening. Especially of note was outstanding wine service for our BYOB bottles: Burgundy glasses provided for the Kistler Chard, Cabernet glasses for the Arrowood, discussing temperature and decanting needs. This is the type of service I don’t mind paying corkage for. Their own wine list is clever and fairly priced. 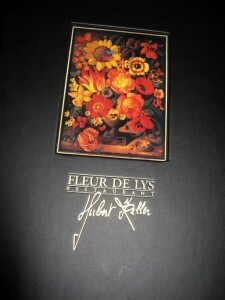 Many, if not all, of the wines are also available by the pitcher or “pichet” which in this case describes a little decanter that holds the equivalent two glasses. Garibaldis Restaurant in Oakland has been around for years. In the past, each time we’d go there, we’d ask ourselves why we don’t go there more often. It’s usually very good. Recently the restaurant made a big change. They remodeled, dividing their space into two restaurants. One part remained Garibaldis and the other space became Marzano, their pizza / small plate concept. On Saturday, we went to Garibaldis for the first time since the remodel. The space is beautiful. Service was friendly and sincere, but spotty in the results. The overly-busy staff did not seem ready for the task though I suspect a lot of the difficulty had to do with the big party next to us. Wine service for our BYOB Phelps Insignia was good with the server bringing us excellent stemware without being asked. Most of the food was good to excellent. My dinner companions liked their salads and hamachi crudo appetizers. My son and I loved our steak tartar. A couple of us were not that hungry and the kitchen and server cheerfully and generously split a delicious salmon entree which was grilled to perfection and served with a yummy pomegranate sauce. The disappointing entree was my own: the potato gnocchi were salty and mushy. Garibaldis has always been loud and this hasn’t changed. The copper ceiling, while beautiful, doesn’t lend itself to sound dampening. The noise level on our visit wasn’t helped by the neighboring table of about 20 twenty-somethings. They were at least tipsy and for some reason, their table could never be full. Two would leave the table just as two more would return. The constant traffic did take away from our experience. So, with more hits than misses, we’ll again return to Garibaldis someday, but as usual, a few inconsistencies keep it from being at the top of our list. Camino Restaurant was opened a year or two ago by Russell Moore who prior to that spent 13 years as produce buyer and in the kitchen at Chez Panisse. That background under Alice Waters served him well. Camino is a simple concept and one that seems sustainable — and probably profitable — in these tough economic times: Have a daily changing menu of just a few items made from locally available ingredients and do it extremely well. A small menu is easier to plan, execute, and manage inventory. But hey, that is just me being my analytical self. One can go to Camino and not even think about business stuff. Just enjoy the delicious, fairly priced fare. Last night there were 6 appetizers and 3 entrees (one vegetarian) on the menu. I’m the kind of guy who ultimately likes trying new and interesting foods but I am often initially intimidated by descriptions of dishes that use ingredients not part of my usual diet. (Sardines come to mind and some Camino dishes use sardines.) But, even with so few choices that often don’t read like I would want them, I have never been disappointed by a dish at my many visits to Camino. The food from their simple, open kitchen and wood burning oven just works. The bar and wine list work the same way. They stock the bar with only the items necessary to make their own, ever-changing offerings of clever cocktails. The wine list is affordable and well chosen. We had a deliciously aromatic 2007 François Chidaine Vouvray Sec “Les Argiles”, Loire ($11.50 glass) with our startest and a rich 2007 Combier Crozes-Hermitage, Rhône ($12 glass) with the duck. If you’re going to charge me corkage, give me good wine service! If you’re going to charge me corkage, give me good wine service. Deep gold color and huge nut and butterscotch nose. Butterscotch and caramel flavors predominate with honey-lemon tea undertones. This wine suffered from rather indifferent wine service at BYOB local restaurant. The requested ice-bucket never arrived. Not rated as I don’t think we were able to see this bottle at its best. 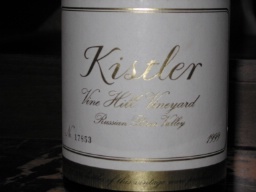 Still, I love Kistlers with some age! Thursday night I had the pleasure (and challenge) of feeding myself and 3 teenage boys at home. Sasha is traveling. What better than some grass-fed rib-eyes from Long Meadow Ranch? LMR is a winery and farm in the Mayacamas Mountains of Napa. Although I have yet to have the pleasure of trying their wines, their produce stand at Rutherford Gardens is a regular stop on my way up the Valley. Selection varies by season. In the winter, one may only find an unattended ice chest full of delicious fresh eggs where you pay on the honor system but in season, a veritable cornucopia of fresh veggies and meats are available. We love their meats, especially the grass-fed rib-eye ($17.99 lb.). And if their produce and meats weren’t good enough, Ted and Laddie Hall and their son Chris, owners of Long Meadow Ranch, are some of the nicest folks in Napa. Check out their website. I just did and it looks like a visit to their produce market is just the tip of the iceberg in experiencing all that LMR has to offer. So what would a great cut of meat be without a great wine? A four course menu is priced at $82 per person though there are additional surcharges on a few menu items. Corkage was $35 which is reasonable in The City at a restaurant of this caliber — especially since they treat the wine you bring the same as if you had ordered it off their list providing proper stemware, decanting, and giving fantastic wine service. Kudos to Marcus, the manager and sommelier that evening for making our dinner special both in food and wine. Last Friday — I think I’m just now recovering a week later — was quite a day of wine tasting. I never take notes during such experiences but do try to at least write down the names of wines I would recommend for my own purchases and others. If I mention the wine, I would recommend it but an * indicates that I found the wine particularly outstanding. Note, I only tried a fraction of the wines available at these events. One would have to be some sort of super taster on a paid vacation to work through all offerings. Taste Napa Valley – part of the Napa Vintners’ Auction Napa Valley. This event featured numerous wineries pouring their current releases, many local restaurants offering wonderful edibles, the closing hours of the online e-Auction with computers set up for last-minute bids, and the barrel auction of future releases. Personal observation and confirmed by several vintners was that bidding was down from previous years. Many bidders at the barrel auction were able to pick up some future cases of quite renowned wines for less than the ultimate release price. I was pleased however with our E-Auction lot which went for $5101. Ultimately the auction raised $5.7 million for local Napa Valley non-profits. This is a little more than half of what was raised last year. Next, it was on to Herb Lamb tasting at Acme Wines in St Helena. 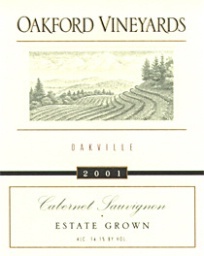 They were pouring their 2007 Sauvignon Blanc, 2006 EII Red Wine, and *2005 HL Cabernet Sauvignon. All were good to outstanding. If you’ve not had a chance to meet Jennifer and Herb Lamb, do it. They were wonderful, down to earth, and charming people. It was also a pleasure to meet face-to-face winemaker Michael Trujillo after so many years. His wife planned my wedding back in 2001. Cheers St Helena – this is the first year for this event held the first Friday of each month (starting last month and ending in October). The merchants of St Helena stay open late and most have a winery pouring inside plus many have restaurants providing munchies. Tickets are $5 a taste, $35 for a VIP one night unlimited tastings, or $100 VIP unlimited for the whole season. This is not your run-of-the-mill wine festival. They limit the number of winery participants to 50 local wineries and there is a waiting list to participate. (I know, I’m on it.) This differs as usually these types of events are begging for participants. Sign of the times, I guess. 2006 Pride Cabernet Sauvignon – undoubtedly this will be a great wine but it’s almost painful to drink now. Honestly, I’m surprised they would choose such a baby to show at this sort of mass venue. I finished up the evening with the delicious Oysters Bingo and the Brutus Caeser sitting at the bar of Cindy’s Backstreet Kitchen. One final “new” discovery, 2006 Six Sigma Sauvignon Blanc (Lake County) by the glass and a small taste from a neighbor’s bottle of *2006 Inman Russian River Valley Pinot Noir.